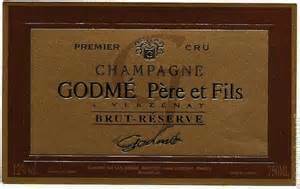 Godmé was established in 1930 in the grand cru village of Verzenay in the Montagne de Reims area 17 kilometres south east of Reims. The Godmés have been vignerons (wine-growers) in Verzenay since the 19th century. Joseph Godmé, Hugues’ grandfather, began bottling just after WWII. A rarity at that time for a small grower and a great testament to the quality of the wines, he was soon bottling all of his production. Today Hugues Godmé is in charge of winemaking and marketing. 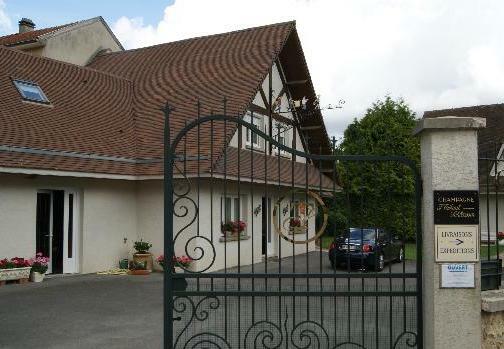 The Godmés have 70 individual small plots totaling 11 hectares (27.5 acres) of vineyard spread across the villages of Verzenay, Villers-Marmery, Beaumont sur Vesle, Verzy and Villedommange. Godmé has an organic approach to grape growing and follow the philosophy of Culture Raisonnée or reasoned farming practices. The estate is working toward a biodynamic certification. Hugues Godmé’s stated goal is to make “light and sensual wines.” Godmé’s champagnes range from the aperitif style Blanc de Blancs to the more robust Blanc de Noirs and vintage wines. Winemaking bells and whistles include indigenous yeast alcoholic fermentation, no malo, low dosages, elevages in old wood, elevage sur lies, and single-site, single-variety wines. This 100% Pinot Noir single vineyard Champagne from Les Champs St-Martin is from vines nearly 30 years old, located in a chalky parcel near the base of the slope in Verzenay. It’s vinified entirely in barrels and aged for 6 years on the yeasts. Was disgorged in September 2014 and given a very dry dosage of 3 grams per liter. 100% Pinot Meunier from 30 year-old vines in the single vineyard Les Romains vinified entirely in barrels without malolactic fermentation and aged for 6 years on the yeasts. It was disgorged in September 2014 and given a very dry dosage of 2 grams per liter. This is a stunning, complete, elegantly balanced Champagne offering pristine red fruit with enough citrus and Pinot Meunier’s distinctive biscuity toast note over a subtle earthy mineral and yeast base. Lovely, Pure, Satisfying. BearScore: 96+. 100% Chardonnay from 46 year-old vines in the single vineyard Les Alouettes St-Bets in Villers-Marmery (on the border of Verzy), this is a chalky vineyard, with little topsoil, and it’s considered to be one of the village’s top sites. Vinified entirely in wood, without malolactic. Aged for 7 years on the yeasts and disgorged September 2013. Dosage 3g/L. Rich straw in color; dry, medium-bodied with freshly balanced acidity; light phenolics. Super rich delicious, integrated, layered, textured, and complete. All the fruit and yeast and mineral are harmonized into a lovely whole. Wow. BearScore: 96+. 60% Chardonnay, 30% Pinot Meunier, and 10% Pinot Noir. All parcels are vinified separately or in small groups (small sites with similar terroir). 40% was aged in oak casks. The champagnes are not filtered. 50+%) reserve wines. Disgorged August 2014 after 3 years on the lees. Dosage: 7 g/l (true brut). Rich strraw in color; dry, medium full-bodied (for Champagne) with fresh acidity. 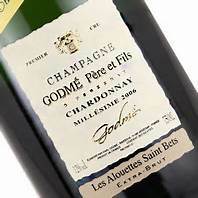 Supple richer style Champagne with taste and depth to go with full range citrus and tree fruit and a bit of red fruit. The richness and texture comes from the high proportion of reserve wine. Textured and dimensional. BearScore: 93+.